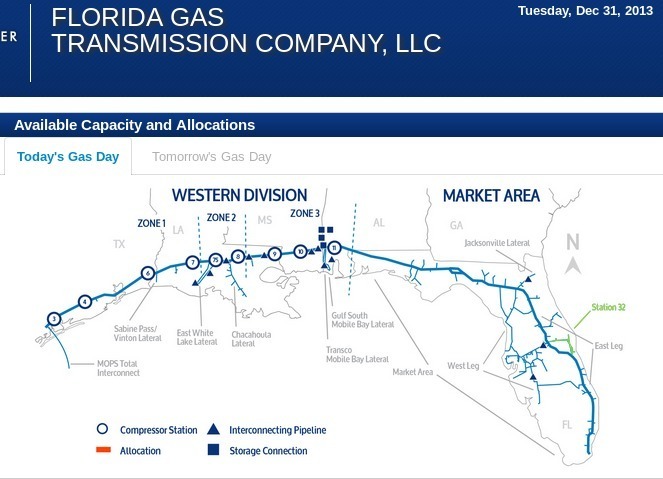 Pursuant to Section 8 of Florida Gas Transmission Company’s LLC (FGT) FERC Gas Tariff, General Terms and Conditions, FGT hereby gives notice of a Force Majeure for the southern portion of the Chacahoula Lateral and the Napoleonville Interconnect, in Assumption Parish, Louisiana. This condition commenced on August 8, 2012 when the formation of a sinkhole in close proximity to the pipeline facilities created a subsidence condition which impinges upon the integrity of the pipeline and creates a potential danger to public safety. The southern portion of the Chacahoula Lateral & Napoleonville Interconnect have been taken out of service and operations will be suspended until an investigation can be completed and action taken to repair or replace the facilities. Florida Gas continues to work with local authorities, the state of Louisiana and other parties as they investigate a sink hole and its impact in Assumption Parish. The following points will be unavailable for nominations beginning Wednesday, August 8, 2012 until further notice. Should you have any questions please call your customer service representative. Going to send this to the local county commission.